In 1852 Henry Saxer established the first brewery in the city, the Liberty Brewery. In 1885 the Bickle Building was constructed. You might have been there if you caught a band lately at theAsh Street Saloon, which is located in the first floor of the building. When it was first opened this was where the Portland City Council convened. In 1888 Henry Weinhard, now owner of Portland’s largest brewery, offers to pump beer to the Skidmore Fountain via the fire department’s firehouses. Fearing people might poke holes in the valuable fire houses for their own personal taps, the city vetoes the offer. 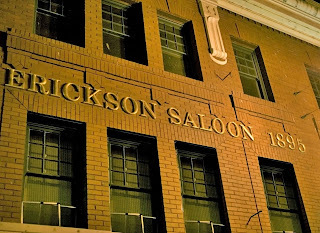 In 1895 August Erikson establishes one of the most well known bars of its time, boasting a bar that measured 684 feet in length. The term used to describe the mixing of gravel with sand and tar to pave a road is called “macadamizing”. Hence Portland’s first street is given the name, Macadam. Once completed, many men spent their evening racing their horse and buggies down this road to the infamous White House, a saloon known for gambling and prostitution located near the Sellwood Bridge. The Multnomah Hotel (now better known as the Embassy Suites Hotel on SW 3rd) was the site of a famous stunt pre-dating Evel Kineval. In 1912 a daring pilot assembled a bi-plane on its roof and flew it safely off the building, with a run-way of only 120 feet. The stunt was re-enacted in 1996. In 1910 the Seward Hotel opens as one of the most respected art-deco constructions in the country. Guarding the building above the top floor stand multiple robots (a feature most people today fail to notice). The Seward later become the Governor Hotel, and its front desk would later become the main bar where drinks today are served at Jake’s Grill. In 1912 the Mallory Hotel opens, and with it came the famous Driftwood Room. Now known as the Hotel Delux, the Driftwood serves to this day. In 1914 Oregon established the Prohibition of the sale of alcohol. Many bars and saloons shut down. Some survived by becoming juice bars (with speak-easies in the back). If you ever find yourself at McCormick’s on SW 1st, take notice of the large metal juicer at the end of the bar. This is the original from that time period, and is still used today. Prohibition in Oregon was repealed in 1933. Of course this only covers the era leading up to World War Two. Future posts will cover the post-war decades. Any comments or questions about Shots of Portland? Post them here. Any pictures of older bars from the past? Please feel free to share them here! I was wondering why you do not mention Louis Eppinger when you write about the Bureau Saloon?